With a dedicated group of EERA JPWind members in Brussels and others through webex, we got a good meeting to discuss R&I priorities for wind energy. 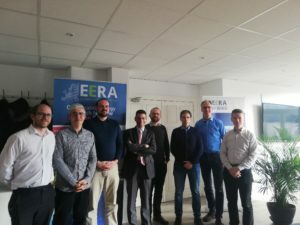 EERA JPWind subprogramme 1 “Programme planning and Outreach” organises a workshop to discuss R&I priorities for wind energy with all JPWind partners. The workshop is largely focused on discussions among the all JPWind participants. The outcome of the workshop is an inventory of R&I priorities related to wind energy. It is expected that EERA JPWind will be tasked to formulate input to EU and ETIPWind strategy and priorities. For that reason, the Management Board will define a strategic roadmap for EERA JPWind. The outcome of the workshop is input for that exercise. The workshop can host 30 to 40 persons max. Registering is important. Since we would like to give opportunity to all partners to join we possibly may have to limit the number of participants per partner.